Contents: Text and multiple-choice test all online. Do you have the Massage Therapy Research textbook? See your enrollment options above for "I already own the text". 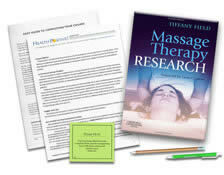 Based on a textbook by Tiffany Field, PhD, this course examines the results of current massage therapy-related research and describes the conceptual application of those results to practice. The textbook is a clear and authoritative review of what is reliably known about the effects of touch in the areas of: growth and development, attention and attention disorders, psychiatric conditions, pain syndromes, stress reduction, immune function and auto-immune disorders. This course does not teach hands-on skills. Please seek additional experience, with a mentor, to add hands-on skills. The research studies in this course were amazing!! I gained a lot of insight in the field of research for massage therapy. I have learned much from this course, and will use its contents to more confidently explain the benefits of massage therapy to all present and prospective clients! I LOVED the clinical data collected by Dr. Fields! Only with exposure to the plain physiological benefits of massage therapy utilizing the God-given healing powers of the body's innate nervous, endocrine, as well as the more well known musculoskeletal systems can the gargantuan pharmaco/surgical banderlog be overcome! You go Ms. Fields! Research can be difficult to understand. The text is very straightforward, clear and provides a number of studies that can be applied to practice today. This was a very interesting compilation of massage therapy studies on a wide variety of health challenges. I'm so glad that I opted to take this class, as it reconfirmed the many, many benefits of massage therapy to truly affect the mood, wellness and general health of those suffering with pain, depression, cancer and numerous other ailments. Great course! I especially like Appendix 2 and the easy-to-reference abstracts. I am looking forward to spending some time in the bibliography and looking at some of the other scientific studies that have been done! The text for this course is excellent and I only wish I had gotten the actual book since it should have a place on my reference shelf. If they come out with a new edition, I would definitely take the course again! I have gained much knowledge and many insights from this course. A wealth of useful information is present in the text. I will definitely use this information in my practice. This course reaffirmed the numerous benefits and impact of massage therapy on overall health and wellness. Great course! Thank you. I really enjoyed this course. The book "Massage Therapy Research" by Tiffany Field was very interesting. I look forward to using is as a reference in my practice to help educate people about the great benefits that massage can do with different disorders. I also like the fact that lots of research in one easy place. I would definitely encourage everyone to read this book and use it. Having it on hand to show our colleagues and share with other health care professionals will be great. Very interesting course. Nice to see all the research that has been done utilizing massage therapy in many avenues of healthcare. I highly suggest getting the book vs reading online. You will want to keep it as its very resourceful. This was way more informative than I expected. Learned a lot. Excellent class! Informative and interesting. Covers a wide range of topics. Great resource for therapists and for patients if they inquire about studies done with massage therapy. Identify the essential elements in formulating a research question and selecting treatment and control groups for massage therapy research. Identify at least one key element in the method and one finding in the results in each of the 3 studies on reducing prematurity. Identify at least one key element in the method and/or the results in each of the 4 studies on enhancing growth and development. Identify at least one key element in the method and/or the results in each of the 6 studies on increasing attentiveness. Identify at least one key element in the method and the key results in each of the 3 studies on decreasing depression and aggression. Identify at least one key element in the method and the results in each of the 5 studies on improving neuromuscular function. Identify at least one key element in the method and/or the results in each of the 4 studies on movement studies. Identify at least one key element in the method and the results in each of the 4 studies on pain reduction. Identify at least one key element in the method and the results in each of the 4 studies on enhancing immune function. Recognize 1 significant research finding from at least 5 of the following areas of inquiry: anxiety, aromatherapy, blood pressure, cancer, cardiovascular conditions, diabetes, the elderly, reflexology, sports, and surgery.